To kids and even more so for boys, hygiene and grooming seem like a waste of time. What’s the point if you’re just going to get dirty again, right? This, of course, would be a valid argument if we lived in the wild and still had to hunt for our food. 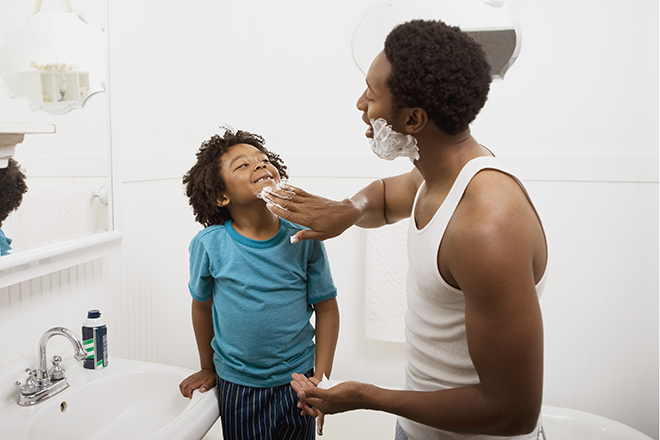 Teaching boys about grooming from a young age is not only necessary, but also an important, albeit basic, life skill. Luckily kids are good imitators so if you lead by example they’ll follow quite willingly. You can never start instilling good oral hygiene soon enough. Not only is it good for their health in the long-run, but flashing a winning smile might get them that interview or a girl’s number somewhere in the future. Teach your little dude to brush his teeth after breakfast in the morning and again before he goes to bed with a fluoride toothpaste. Hairstyles are bit more fluid today and boys don’t absolutely HAVE TO rock a short haircut. They can hang ten with longer tresses if that’s their vibe… or yours. But taking the little guy with you to the barber can be a fun tradition and bonding experience. Sorbet MAN offers various options for the ‘laaities’, even if it’s just a trim. There should be nothing strange or funny about a man getting a manicure or a pedicure. Normalising this grooming habit is essential and teaching your son that applying a foot cream every now and then will only make his feet soft and not him. Rough hands and cracked heels is never a good look or feel for that matter. Teach him to keep his nails short and clean and gently push back the cuticles for a groomed look. Never underestimate what a little bit of soap and water can do. Boys are usually more active, which means there’s probably a lot of sweating going on. No amount of deodorant will ever get rid of body odour that builds up throughout the day. That primal scent is caused by bacteria on the skin and the only way to get rid of it is by taking a shower. Boys and men for that matter don’t have to spend 10 minutes under the shower, just teach him to wash all the important parts. Try Sorbet MAN 3-in-1 Body Wash Max Active, R40.00. Grooming tips via Sorbet Man.